I hope this will find you in good spirits in spite of much doom and gloom around the globe. Hopefully this newsletter will lift your spirits a little. I have been asked recently what we do in the different sections of the project. Our website is becoming out of date and needs re-doing, hopefully that will be completed by the end of the year. This time I decided to write about the mornings, concentrating on the nursery children, meaning at some point to continue on to what we do with the Primary and Secondary children too. We have a fairly large number of new names on our mailing list – welcome to the family, I hope you enjoy the news. My grateful thanks as ever to everyone for your kind support. We can do nothing without you all. What are our mornings like? 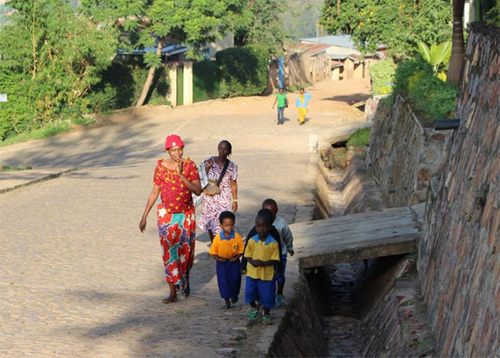 One of my greatest pleasures when I am in Rwanda is to go out onto the road early in the morning and watch the children usually running to school with their parents, siblings, sometimes on their own. They are almost always smiling, so happy to be coming to school. Why is this? 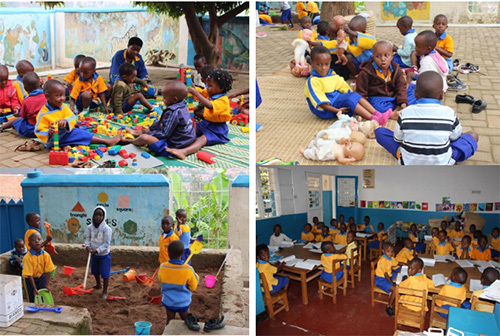 Because education is a highly valued prize, a chance treasured by our families who know they would never have the money to go to one of the very many private nurseries in Kigali and who thought their children would never be able to benefit from a nursery education. We offer free places to families we know are poor and they are very eager to get to school each morning with all the treats in store, some waking me up with their excited chattering from about 6.30 even though we do not start until 8 a.m.
Staff arrive early, two are out on the road with their high viz jackets, ensuring safe crossing on a road where some vehicles are driven to quickly. The terrace is swept clear of leaves and dust ready to start the day. Some mornings the children are very cold, especially if it has been raining, but the sun warms us up most days. All are happy to be in a safe, clean environment where there are so many opportunities to be with friends and learn something new. In the mornings there are the nursery classes and some classes for the children we support in Primary school. We begin with an assembly on the terrace when we first sing the National Anthem. Teachers take it in turn to lead assembly; all have different ideas and presentations prepared for the children. Sometimes we will practise a numbers game, some English vocabulary. Then we will talk about anything special which has happened over the weekend, maybe there was thunder and heavy rain the previous evening which gives an opportunity to talk about the weather and sing the song ‘I hear thunder’ Maybe something is happening that day, or there are general notices or reminders. Finally we will sing another song or two, often with actions, some in English, some in Kinyarwanda before dispersing. The children then go to their different classrooms. During the morning the nursery classes take it in turns to be on the terrace where they have group activities which they enjoy. Most of our children do not have many material possessions at home, toys and books are very rare, playing time also, so the chance to engage in play activities, encouraging talk and exploring ideas is extremely important. The children gain so much from these activities which they can take into the classroom. The majority of the materials and equipment they use has been brought from the UK and Europe by myself and by other visitors. We just love the dolls and the Lego, we look onto the city centre with its high towers so building big tall towers is very popular. Last year we built a sand pit which is great fun and has produced some really inventive activities, the children just love it once they have passed the simply digging stage – the tools get very heavy wear! In the class, when not doing group activities the children are engaged in foundation learning, numbers, letters, names etc with basic writing, drawing, painting, counting, music, listening to and telling stories and so on. Before the children go out to play mid-morning they have a cup of porridge with a piece of dry bread. They absolutely love it and wait patiently until every child has a cup and a bread roll before eating it in silence, savouring every mouthful. For some, this is the first food of the day, and we have learnt that sometimes in the past, it has been the only food they have eaten that day. And so out to play, where a few stones or an old ball and a few skipping ropes are all we need. Back to class for a story or a music session and it is time to go home, Nursery 1 at 11.30, Nursery 2 at 12 mid-day. Our nursery – safe secure, happy, thanks to you all who support us. We can do nothing without you out there.